There are hundreds if not thousands of things you can do with a Raspberry Pi and that's half of the attraction of everyone's favorite credit card-sized PC. One of the most popular projects, though, and one that has hundreds of its own dedicated add-on boards and associated components is robot building. It's rarely easy to get started. You need the right motors for the chassis, the correct voltage for the sensors, and a way to power everything for more than 30 minutes without waiting another three hours for the batteries to recharge. 4tronix  think they have the answer with Pi2Go-Lite  (Figure 1). Like many other solutions, it offers a complete "one stop shop" kit, and all you need to do is add a Raspberry Pi and some AA batteries. It's cheap too, starting at UK£ 30, making it barely more expensive than the Raspberry Pi itself. At that price, of course, you need to assemble everything yourself and it does – even by the maker's own admission – involve quite a lot of soldering. According to 4tronix's build instructions , it will take about 90 minutes to put together from scratch. 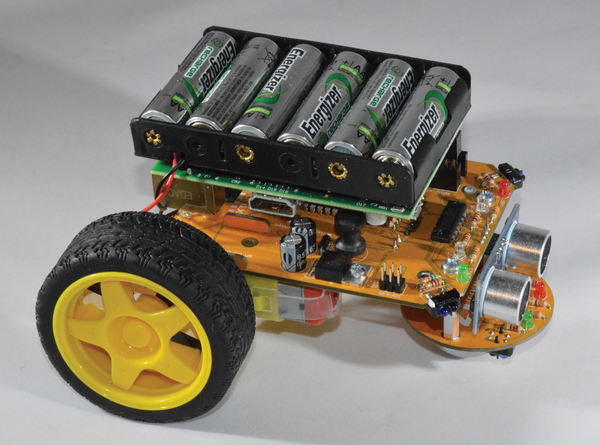 Figure 1: The Pi2Go-Lite from 4tronix is a very affordable robot kit for Raspberry Pi. Given that its target audience beyond Raspberry Pi geeks like you and me is schools and computer clubs, the price range is spot on, and the challenge of building it from scratch will help everyone learn some rudimentary electronics, too. Pi2Go-Lite might be affordable, but what else sets it apart from the many other robot kits you can find online? First and foremost it has an award-winning pedigree. Its maker (and 4tronix owner), Gareth Davies, knows more than a thing or two about building educational robots, having designed two of the world's most successful models. It started for Gareth in the late 1970s when he used to design and build personal computers, complete with homemade operating systems, for his friends to play games on. What started as a hobby soon turned into his career, and by the early 1980s Gareth was working at Research Machines (RM), a massive UK-based education technology firm. RM was selling the same kinds of computers to schools and colleges that Gareth was making for his friends, so working as one of only three hardware engineers was a perfect fit. Some years later, another education-focussed company called TTS became part of the RM group, and Gareth became the architect that developed BeeBot, a multi-award-winning floor robot that was (and in some places still is) one of the most popular turtle-like floor robots in schools around the world. "It's essentially a 'turtle bot' with simple controls," explains Davies. "It has directional buttons on it, and you had to press a sequence and it would follow it. Two steps forward, spin right, three more steps forward." It was – and still is – a great way to teach control, flow, and other key concepts in computational thinking, the school of thought at the heart of computer science. Gareth has been waiting for the right hardware to come along so he can do it all again with modern computer technology, and he thinks he's found the perfect fit for Pi2Go. "The Raspberry Pi is actually the thing I've been looking for, for 20 years," he enthused. Pi2Go isn't just exciting because of its award-winning heritage, it also has a very original design. Most small robot platforms controlled by single-board computers or microcontrollers have a separate chassis – a robot body to which everything else, like the micro controller, add-on boards, and sensors, are connected. Most of these platforms are made of thin plastic, which tend not to stand the test of time or a tumble from a table to the ground. In contrast, Pi2Go's chassis is the motor control board and sensor package. "Instead of having a separate chassis to which you bolt your motors, computers, sensors, and everything else, what I wanted to do was make it a bit easier," explains Davies. "It occurred to me that one of the best building materials is not acrylic since it snaps so easily, but PCB itself. It's made of glass fibre, and it's really solid, so you can actually use it as a chassis and have all the sensors and controllers built into it from the start." Gareth's idea was born of a need to create something robust that could be used in schools and computer clubs to create real robots that follow lines or can sense distance or light, but with Pi2Go-Lite he's actually managed to create a small and manageable robot with one of the most densely populated array of sensors you'll find on the market today. And it's all made from two small pieces of printed circuit board (Figure 2). 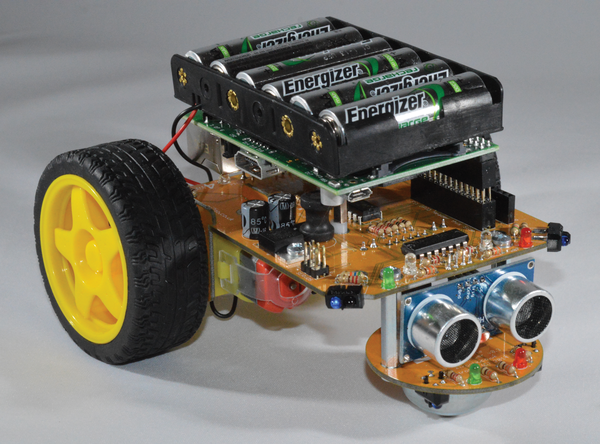 Figure 2: The Pi2Go-Lite chassis is cleverly designed from the electronics PCB itself. The main circuit board – which also acts as the "deck" of the robot chassis – has six LEDs of various colors, a momentary button switch, a motor controller, two IR reflectance sensors, an ultrasonic distance sensor, and two connectors for servomotors. That doesn't including the 5V switching regulator, which ensures you get excellent battery life from six AA batteries that power everything, including the Raspberry Pi, for more than two hours at a time. As well as robotics hardware itself, there's also the Raspberry Pi GPIO connection, brackets to which the motors connect, and connectivity for the smaller PCB, which holds the front caster wheel and line-following sensors, among other things. As you can see there's no shortage of sensors and features on offer (see the "Pi2Go-Lite Features" box). With the basic setup you could program any combination of line-following or autonomous robot scripts, but it's also possible to add a couple of extra features to Pi2Go, not least of which includes things like the camera module, which could allow you to do some very clever computer vision projects or remotely control your robot from a web app.